Experience driving a segway through one of Europe´s largest urban parks with an expert guide.You will discover incredible places and learn of legends and curiosities in contact with nature. You will see riparian forest, pine trees, medicinal herbs, a lake, etc. You will discover trenches built during the Civil War and other constructions such as the beautiful Serpents Bridge. 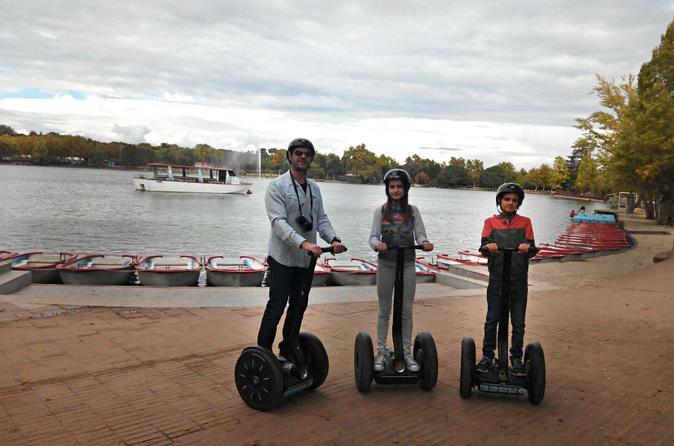 Enjoy the greenest tour in Madrid with your Eco-friendly segway!!! Casa de Campo is the largest urban park in Europe, with more than 1750 hectares. Casa de Campo means “Country House” and gets its name because it was once a royal hunting state. Public park since 1931, An amusement park, the zoo, an artificial lake and a cable car are few of the things we can find located in the park. Your journey begins in the Royal Palace, home once of the Spanish kings and their court. Passing by the gardens of Sabatini, from where you will have a beautiful view of the Palace, and going through Cuesta de San Vicente, we reach the San Vicente Gate, one of the remaining gates from 18th century city wall. After seeing the river and crossing the Bridge of the King, you will reach Casa de Campo. For about an hour you will see what the park has to offer you. After passing by Sabatini’s aqueduct you will do a tour around the lake and enjoy its nice atmosphere and its beautiful view. You will head afterwards to a little hill from where you can enjoy the view and see the skyline of the city. You will finish then in Huerta de la Partida, a restored XVI century vegetable garden built to produce food for the disappeared Casa de Campo palace.